Many homeowners in the Boston area are installing radiant heated floors for use as their primary home heating source as well as in select rooms to supplement their existing home heating system. As many owners of radiant floor heating systems attest, nothing is finer than walking on a warm floor during a cold winter day. Radiant heated floors are often installed in bathrooms as well as in rooms where children spend a lot of time playing on the floor. Warmzone offers a variety of electric and hydronic floor heating systems for homeowners in Boston and the New England area. And because Warmzone manufactures and carries the industry’s most trusted floor heating systems, our experts can evaluate your needs and determine the best system for heating your specific floor type. Our selection helps to ensure that you receive the most effective floor heating system for the unique layout and floor type of your home. 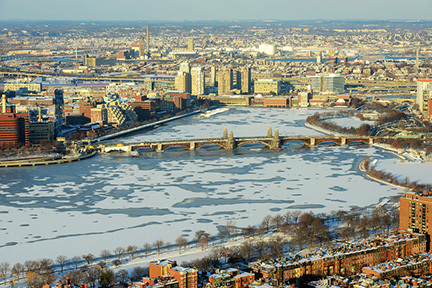 Boston Longfellow Bridge across Charles River during winter, Boston, Massachusetts, USA. While there are some standout radiant floor heating systems, it is important to know that no single floor heating system is ideal for every type of flooring. That’s why it’s so critical to speak with an unbiased radiant heating expert who can offer you a wide selection of reputable floor heating options to choose from. Don’t be talked into purchasing a floor heating system simply because it’s the only system that the provider offers. Deal with an industry leader that can show you a wide selection of radiant floor heating solutions and explain the benefits and traits of each one. The most proven system for heating tile floors is the ComfortTile floor heating system. ComfortTile features thin 1/8 to 3/16-inch diameter heat cable that is available on spools or pre-spaced on flexible fiberglass mesh backing with adhesive so it can be rolled out and then secured to the subfloor for easy installation. ComfortTile heat cable is also one of the most versatile floor heating systems. 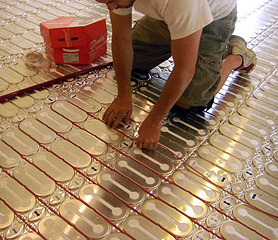 Installer shown placing the ComfortTile heat cable into the grooves of HeatShield floor heating insulation panels. This system is one of the most efficient floor heating systems on the market today. Many homes in New England feature hardwood or laminate flooring. Warmzone offers several choices for heating hardwood and laminate, but the most popular solution is the low-voltage FloorHeat STEP system. 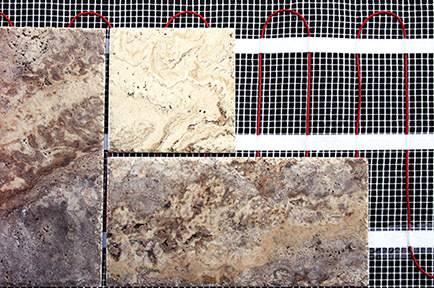 This unique floor heating system features a self-regulating, semi-conductive polyethylene heating element. Because the flexible heating element is so thin, it won’t affect the floor buildup, weight loads, or your choice of flooring. The unique attributes of FloorHeat STEP make this versatile heating element a popular choice for heating roofs as well. RoofHeat STEP is one of the most trusted roof heating systems available. 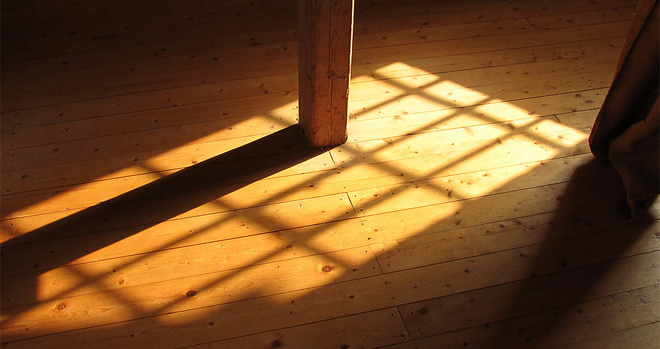 (Learn more about heating hardwood floors. and tips for Installing Heated Floors. These are just some of the choices Boston residents have to heat their floors. Whether you’re looking to heat carpet, tile, marble, hardwood or any other type of floor, you won’t go wrong dealing with Warmzone. In addition to Warmzone’s industry leading products, Warmzone provides unparalleled customer services, which include professional system design, free installation training courses, and personal installation support. Call a radiant heat expert today at 888.488.9276 to discuss your floor heating options. Warmzone snow melting systems continue to set the gold standard for the radiant heat industry. 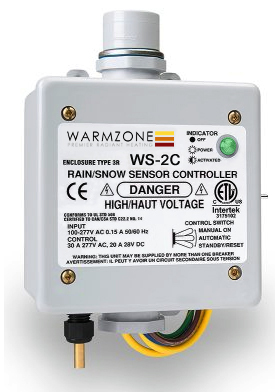 In addition to the recent enhancements to its industry leading heat cable, Warmzone has also added some performance enhancing features to its state-of-the-art WS-2 snow sensor, resulting in the WS-2C aerial mount snow switch. Universal Input Power Supply (Auto Select Input Voltage)—The universal power supply auto selects the input voltage (100v to 277v AC). This simplifies the installation process and eliminates the need to install voltage jumpers (to select the operating voltage). Sensitivity Control—Climates vary geographically, so it stands to reason that the conditions leading up to a precipitation event (like a snow storm) will vary too. Warmzone units allow for greater calibration of your snow melting system. The WS-2C aerial-mount snow sensor features unmatched sensitivity control, giving you the optimal customized snow removal solution. The advanced sensor can be programmed for specific conditions to help eliminate false trips, ultimately saving on energy costs. Increased After-run Delay— Warmzone snow melting systems are designed to remain on for a short period after the storm to prevent the melted snow from turning into ice. The WS-2C offers run delay times of 30-90 minutes, and 2-6 hours. The “delay off” time can be adjusted by using the DELAY ADJUST control. Power Indicator Light – Indicates when the sensor is powered AND when it is activated. Redesigned Case – Greatly reduces the chances of warping the cover due to over tightening of the screws. One of the main reasons Warmzone attracts and retains so many repeat customers is a refusal to stop at “good enough” when it comes to radiant heat solutions. Warmzone professionals make it a point to immerse themselves in all things radiant heat related, keeping an ear to the ground when it comes to the latest and greatest in snow melting technology. They take time to speak with installers on the front lines to find out what’s working and what isn’t, so you receive the most advanced snow melting technologies available. It’s this passion to be the best of the best, to provide customers with the most advanced, efficient snow melting solutions, that has made Warmzone an industry leader for more than a decade. Learn more about the latest snow melting system technology by perusing the Warmzone webiste, or call today to discuss your custom radiant heat options at 888.488.9276. The ComfortTile floor heating system is one of the most popular radiant floor heating options on the market. Compatible with all standard sub-flooring materials, ComfortTile floor heating systems offer the premium performance expected from the industry leader. ComfortTile floor heating cable (in mat) show underneath tile. Thinset can be applied directly over the heating cable, resulting in easy installation and efficient heated tile floors. The systems are easily installed under all types of floor surfaces to provide comfortable, even floor heat. CT radiant floor heating systems provide efficient room heating and reduce the transmission of dust, allergens and other airborne particulate matter associated with forced air systems. The heating element consists of heat cable on the spool or pre-spaced and woven into an adhesive-backed fiberglass mesh, depending on your preference. The floor warming mats are pre-terminated for use with 120 and 240V, and are available in various lengths (24-inch width). While both cable systems are easy to install, the cable off the spool is particularly convenient for custom shaped floor heating projects. The Warmzone ComfortTile electronic thermostats are specifically designed to control electric radiant floor heating systems for maximum comfort while minimizing power consumption. Each thermostat also includes an integrated Ground Fault Circuit Interrupter (GFCI, Class A). Easy to Install: The mats feature an adhesive backing and can be rolled out for quick, easy installation. Requires no Floor Buildup: The cable is only 1/8 of an inch thick, so minimal or no floor buildup is required. Energy Efficient The system has outstanding energy efficiency with virtually no heat loss. Smart Control: 7-day programmable thermostat to accommodate your schedule. Installation Support: Warmzone provides technical and personal installation support with each system. Complete System Design: Warmzone design experts provide complete,system design services.